R.L. 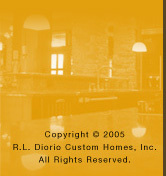 Diorio is constantly searching for new and better products and methods to construct its custom luxury homes. Some of the more recent products that are being utilized by Diorio include Engineered I-Joists for the floor systems, Advantech sub-flooring (a resin impregnated oriented stran board (OSE) that is water resistant and formaldehide free), Medium Density Fiberboard (MDF) interior trim for painted trim homes, high efficiency power vent water heaters, spray knock-down ceiling texture, water management EIFS systems, and many types of cultured veneer stone just to name a few.